This is an entry in one of Bearport's habitat series, "Arctic Animals: Life Outside the Igloo." 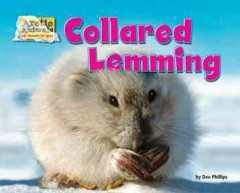 Lemmings are cute. Aside from that one fact (and the whole "jumping off cliffs" misconception) I didn't really know anything about these rodents. 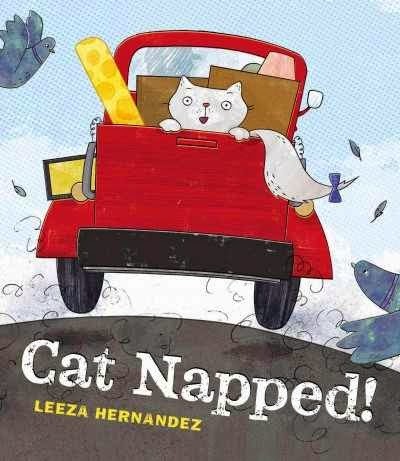 This simple nonfiction book takes the reader through their habitat, habits, appearance, predators, food, and more facts. 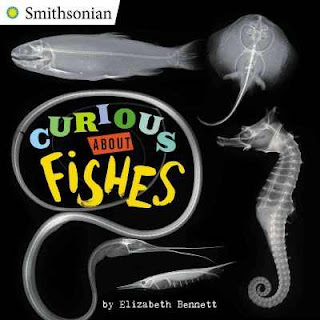 Back matter includes suggestions for projects, "Science Words" which is a glossary, a brief index, two suggested books, and a link to the publisher's website with more information. This book is packed with photographs and information and is at an easy, intermediate reading level. I really like Bearport for filling in animal series fiction. They do a lot of high-interest titles with mostly helpful collection different types of animals or abilities. Their books are a little cheaper than the average library bound series nonfiction, but I feel like they offer more content that's still at a manageable level for intermediate readers. This series includes titles on the arctic fox, harp seal, polar bear, reindeer, and snowshoe hare. Verdict: If you're updating your animal section, or if you need to support curriculum that covers habitats (I'm sorry, biomes) then this is a good series to select. As I was thinking about new posts on the library, I realized I don't think I've ever shown off my children's area. First of all, I would like to very clearly state that it is almost NEVER this tidy. There are blocks all over the floor, sometimes trains, the puzzles lose pieces, the tub books get messed up, etc. It doesn't really bother me. I figure the next family in will tidy up, or staff will clean up at night (this greatly annoys some staff, which I can understand since I'm not usually the person who cleans it up, but I still don't think it's a big deal). Welcome to the children's area! The beginning of the picture book section is to your left, the movies to your right. You can see where I unsuccessfully stuck posters to the shelf end on one side. The children's area is remarkably free from children! Our train table is definitely the most popular, followed closely by the Duplo table. The train table was purchased from Melissa and Doug and is badly in need of a paint job. The duplo table was bought....off Amazon? and probably needs to be cleaned too, but I'm not looking too closely. Here is part of the toy storage and the tub books. I put pictures on all the baskets and the shelves so they could be matched up. The kids are usually pretty good about using them. There is a tub of Duplos, a tub of links (in the shape of cars, trains, etc.) and three baskets of soft, squishy blocks. Also, puzzles. On top of the shelf are our book bundles and the box for take home storytimes. Empty at the moment, alas. Looking out of the play area, you can see the picture book shelves etc. Incidentally, we call it both the children's area (which may also refer to the ENTIRE children's area) and the play area. On the other side are the board books. Usually we put some on display, tucked behind/under the backs of the CD cases. Coupon holder (which is empty), tissues and hand sanitizer, and art to pick up, which will soon be weeded out. This is our very ancient couch, which is badly in need of replacement. Also, the ancient trash can. Recently I moved the 1,000 Books Before Kindergarten over here and switched the couch and table to their current configuration. The table wobbles, which drives me insane. All four of the chairs belong to the table, but I usually stick a couple by the Duplo table. And, again, the big door to our storyroom with flyers. I was really going to get all the reports and paperwork finished on Monday. But we had a staff meeting, and then the school brought all the kids and we had to hang out, and then kids needed help finding things and then a kid got lost (only not really)...I did manage to finish nearly everything though! Tuesday I was covering the evening shift for a colleague and had all sorts of plans for the morning at home. I slept most of it. Then I worked on lexiles and made myself so sleepy that I had to shelve movies to wake up. Wednesday I worked on movies and then lexiles. I've finished reformatting and updating the lists that were done and now I'm figuring out how to do the rest that have to start from scratch...I've decided instead of downloaded the massive Excel files, to use the Pinterest boards of recent purchases and work backwards from there. I spent about 20 minutes trying to fix a stupid thing in Word and.....the big news of the day.....I'M GETTING A SINK!!! I have wanting a portable sink for my program room for pretty much seven years and the Friends are giving me one! It's the best present ever *sniff*. and then of course Scholastic Reading Counts crashed and I couldn't work on the Lexiles project. CURSE YOU SCHOLASTIC READING COUNTS AND LEXILES!! long coaxing RA with a reluctant reader. Finally got her to take Smith's Stormrunner, Drama and Sisters and an audiobook to try. Maybe. Recommendations for a 5th grader with a super high reading level and interest in engineering and robotics - Macaulay's Building books and MAKE magazine. I've had this on my to read list for a long time but I finally picked it up for a book club which needed a Wisconsin author (and then didn't finish it and didn't go to book club anyways. Ahem.) anyways, I admit that I bogged down a bit but managed to finish it, which makes me wonder if I've lost my taste for middle grade fantasy or if this just....wasn't very good. Aldwyn is a clever alley cat, able to avoid any dangers in the medieval town he lives in. But he can't survive being chased by the most dangerous of the bounty hunters, especially when the hunter uses magic. A series of lucky occurrences and Aldwyn finds himself mistaken for a magic-working familiar and going home to a new family, which includes his "loyal" Jack, know-it-all blue jay Skylar, who has some secrets of her own, and the friendly but dim frog Gilbert. 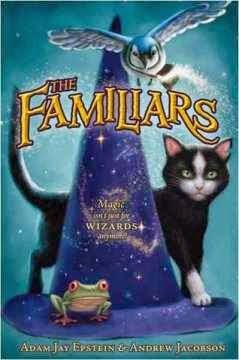 Aldwyn barely has time to settle in to his new life when there's a catastrophe of epic (and magical) proportions and he finds himself on a dangerous journey with the other two familiars to save their loyals. It's no surprise that the authors are screenwriters since this book reads a lot like the screenplay for an animated movie - lots of quirky magical creatures and descriptions of scenery, some simple twists and turns, and a cliched ending with a soppy moral. The series itself has been optioned for a film, but is listed simply as in development, no actual release date is planned. Verdict: Even with a movie planned, this doesn't strike me as the type of project that increases demand for the book when the movie is released; more the type of thing where people are surprised to learn it's based on a book. It's predictable, poorly plotted, and rather boring overall. However, plenty of kids have enjoyed the series and it's no worse than, say, the Warriors series or any of the gazillion and one medieval-fantasy-with-animals books out there. There are, however, quite a few of those and this is nothing particularly new. So, an additional purchase if you have a plentiful budget, demand for this type of book, or fans of this series in particular. A lot of publishers are jumping onto the "easy readers in comic format" with varying degrees of success. I've been skeptical about some of them, but they've turned out to be quite popular, and even more important, I've been finding parents slowly starting to be more willing to let their kids read them, so I'm looking for more in this genre. This is from a new series, Jump-Into-Chapters that I thought I'd take a look at. The main character, Mr. Ball, is...a ball. He rather reminds me of the Mr. Happy etc. characters. In the introduction, we meet Mr. Ball and his cat, Ms. Kitty Cow, who goes crazy when she eats hot dogs. In the first chapter (part 1) Mr. Ball and his friends go to a circus and love it so much they decide to have their own circus - and Mr. Ball volunteers to tame a wild and scary animal! In part 2, he is trying to decide upon a big, fierce animal. His friends tell stories to dissuade him, but he chooses to take a Giant, Fire-Breathing Tweety Blob! 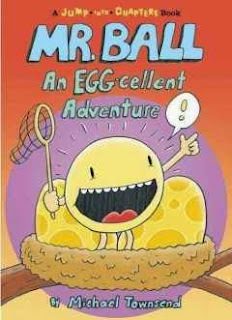 The next two chapters involve Mr. Ball's attempts to tame and capture a Tweety Blob, his ignominious failure, and his friends' rescue. He thanks them all and decides to tame Ms. Kitty Cow to start with. A brief epilogue hints at more adventures of Mr. Ball to come. The art has a light, cartoon touch. There are squiggly arrows showing where to begin each chapter and the movements and speech bubbles are large and exaggerated, helping beginning readers follow the story in both words and pictures. Lots of visual cues keep readers abreast of the story. The book itself is a slightly oversized, hardcover easy reader shape. It will stand out on the shelf, being a little larger and thicker, but not too noticeably. Verdict: This was personally a little too silly for my tastes, but kids will gobble it up. It will be especially attractive to struggling readers who want a little more humor and action but aren't quite ready for chapters yet. A fun and popular addition to any easy reader section. Some series never reach the heights of the first book, or they start out weakly and improve as they go along. But Maple and Willow's stories keep the same simple, high quality storytelling and art in every new addition. I first fell in love with this series when Maple was a little girl, waiting for a new sister and a new tree to join her in Maple. Maple & Willow Together features the sisters learning to get along and, despite occasional squabbles, having a close friendship. But now Maple is growing up and going to school and the sisters have to renegotiate their relationship. Willow is lonely and jealous of Maple's new adventures and Maple seems to have forgotten the little sister she left behind. Can Willow make everything better again? Nichols' simple prose and delicate illustrations bring to life the sisters who are growing up and changing, but are still so much alike. The glorious fall colors are echoed in the rainbow hues of Willow's imaginative adventures. 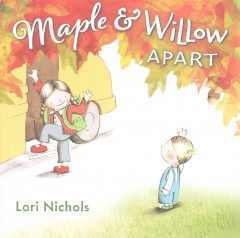 The spreads of Maple and Willow interacting are spot illustrations on a white background while Willow's adventures with her new friend Pip explode into full-page color. Subtle details, like the endpages changing from green to orange, catch the eye and make this one to reread again and again. Verdict: Parents will be sniffing at the bittersweet story of two sisters growing up and even children who don't have siblings will understand what it's like to struggle with changing as you grow older. Another pitch-perfect story from Lori Nichols about two sweet sisters. Highly Recommended. This is the first in a new series called Curious About... and features a unique method of teaching kids; x-rays! Each spread talks about a different aspect of fishes, illustrated by both a live fish and a x-ray that clearly demonstrates the trait under discussion. So a spread talking about gills shows, on the left, a brilliantly-colored school of snappers and on the right, against a black background, the text and an x-ray of a red dory illustrating the skeletal plate protecting the gills. Additional facts are sprinkled throughout the book and at the back there's a key to the specimens that provided the x-rays and a glossary. The text is intermediate, simple enough to read aloud to a class of children, but complex enough to challenge a 1st or 2nd grader. It's a fascinating look at the anatomy of various fishes with lots of attractive photographs, excellent text, and a nice layout. So, what's wrong with it? Well....this series is only available in paperback. Now, I will buy some nonfiction in paperback (and I'm pretty lonely in that decision - my director still looks askance at me about it) but I absolutely won't buy popular, i.e. animal, books in paperback. They'd disintegrate at the first little sticky hand or disappear the minute they're put onto the shelf, sliding back between the bigger books. Hopefully, when more of the series is released it will be available in a prebound edition. Verdict: This would make a great addition to a homeschool curriculum or to add to your prize books (you DO offer nonfiction prize books, yes?) but until a hardcover version is available I couldn't recommend it to a library with any kind of decent circulation. It's too bad because it's a really great idea and I loved the book. The call for judges is live and you have until September 9 to throw your hat in the ring (make sure it's a party hat, since it is our tenth anniversary!) There are lots of great reasons to apply to be a Cybils panelist or judge - reading tons of great new books, the wonderful discussions, the excitement of the award process, new perspectives, etc. but why should you apply for MY category in particular? Nonfiction can sometimes be an afterthought but it's really a vitally important area and one that's growing and becoming more amazing all the time! Fewer books. Do you really have time to read through a couple hundred chapter books or ya fiction? Nah, didn't think so. Variety. Don't think you like nonfiction? Can't stand biographies or creepy-crawlies or....in the nonfiction category there's something for everyone! You'll read amazing books you might never have picked up before Cybils and discover whole new subjects you'll want to learn more about. Improved professional skills. Are you a teacher or librarian? Nonfiction is a hugely popular genre for kids. Wouldn't you like to see the best new books in the field to recommend to your readers? Learn new things. Did you know about Angel Island, how butterfly hatcheries work, the latest research in saving cheetahs, that Hispanic and Latino Americans suffered from segregation, or that black mustard plants have a defense system? Neither did I, until I read last year's Cybils finalists! Start small. If you're not sure you're ready to jump in the deep end with hundreds of books, or have the responsibility of picking the ultimate winner, try applying to be a first round panelist on one of the smaller categories like Elementary/Middle Grade Nonfiction, Easy Readers/Chapters, or Book Apps. You have a better chance to be chosen in those categories as well, since there tend to be fewer applicants. So, join us for Cybils this year and get your read on! taking it to the winning school librarian. I hope Ms. S.
When did I become a supervisor and get stuck with all this PAPERWORK? Sigh. Monday I powered through paperwork, newsletter, and website and the evening on the desk. Tuesday I shifted and weeded juvenile fiction, discovering just before I left that I was one shelf short and had to reshift practically from the beginning. ARGH. Wednesday I finished juvenile fiction, processed new materials, refilled all the displays, and worked on the missing list. Inventory did not go as I had wanted. Note to self - do not have volunteers inventory, no matter how helpful they long to be. And maybe August is not the best time to inventory when things are in a mess. Do inventory right next time. Ended up shifting and shelf-reading all the holiday books as well. Made handouts for take home storytime. Thursday I fiddled with the budget and trying to figure out where we're moving the wifi thingy. I also started updating the 1000+ lexiles list, a necessary evil, filled displays, put out take home bags and coloring sheets, and answered lots of questions. The main project was getting all the marketing for September-October in place. Most of it was done, but I had to figure out what still needed to be done. I managed to finish almost everything! And still had time to process a few more new books. Friday (half-day) I finished the last bits of marketing through October. Processed the last of the new books. Finished reformatting the 1000+ lexile list and almost through updating. Struck out on a request for a medieval/high fantasy titled "dwarf" or another fantasy series we don't own. Suggested Happy Happy Clover to Chi's Sweet Home fan. Margolis' Boys are Dogs series for How to Survive Middle School fan. Peg Kehret - threw me b/c I thought she was saying "peg carrot" and totally blanked for a minute. Books about feeling and character - neighborhoods for the win! There are a lot of beginning chapter books featuring small girls. Junie B. Jones, Princess Posey, Lulu, Cam Jansen, and I could go on and on. Many of them have some defining "quirk"; either the girls are interested in animals, or mysteries, or being naughty. So what makes this new series about Piper Green stand out from the crowd? First of all, Piper Green lives on an island. Secondly, there is a real fairy tree near her house! 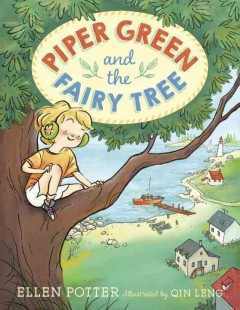 In her first story, we meet Piper, an ordinary girl who lives in a very different place; on an island! She's having trouble adjusting to her older brother leaving home for the mainland for high school and other changes, like the new teacher who looks like a fairy princess but is NOT understanding about Piper's monkey ear muffs. Eventually, an understanding neighbor and the discovery of the wonderful fairy tree bring about a happy ending for all. 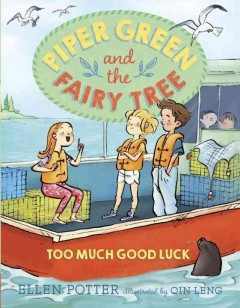 In her second adventure, Piper Green is very upset when her class has to send away their beloved rabbit because of a new girl. She does something really bad without even thinking about it and now she doesn't know how to fix it. Can the fairy tree help her again? Piper isn't the noisiest, naughtiest girl in the class, a la Junie B. or Ramona, but she definitely has a strong personality. Like any second grader, she has strong likes and dislikes and doesn't always think about the consequences of what she does. Small things, like the color of her bedroom and the class pet, loom large in her life but she has good friends and supportive family to help her through her difficulties. I love Qin Leng's picture book illustrations and she's an excellent choice for the black and white spot illustrations in a beginning chapter book series. Her characters are distinctive with a touch of diversity and flesh out the stories to show their enthusiasm, disappointment, guilt, and friendship. Verdict: There are plenty of beginning chapter books featuring every day life for young girls and I felt the first book was a bit bland and a little confusing (I thought until the end that her brother was dead) but the second book had a great plot and was really funny. I would say this is a solid offering with a few fun twists - the fairy tree and life on the island. I expect Heidi Heckelbeck and Princess Posey fans to enjoy this series. The text is the classic I spy game, using letters "I spy with my little eye something beginning with the letter O" for example. It's not an alphabet book - the letters featured are random, but when you look at them in order they spell O, C, E, A, N. The last spread adds an additional fact about each animal featured. 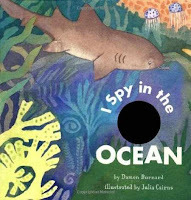 A note on the cover - the black circle is a die cut hole and I don't know why it's black - on the actual book you can see a clownfish through it. The holes in the book show a glimpse of the animal you're guessing, then when you turn the page it becomes part of the name of the creature. The placement of the holes is clever, but it doesn't show enough of the animal and the animals chosen are too complex - Nurse Shark? Seriously? The pictures really didn't grab me at all - too watercolorish, not enough clearly defined lines and images for a board book. Verdict: I like I Spy books, but I wouldn't use this with a board book audience. I'm not even too thrilled about it as a picture book. Edward Gibbs' I Spy books are much, much better. I don't know why it took me so long to read and review this book. I loved Waiting for Winter and read this to much laughter from the kids every year. So, the story begins with a wordless spread on the endpages, showing a cart full of objects, one of which bounces away and....lands on Squirrel's tree. Mr. Squirrel wakes up and immediately goes into full-blown panic. The moon has fallen out of the sky! People will think he has stolen it! Visions of himself in a tiny uniform, trapped in a jail cell ensue. Fortunately, he manages to get rid of the moon. Unfortunately, it lands on his friend Hedgehog....and so it goes, getting wilder and crazier, with more and more animals packed into the sad vision of the jail cell, until they finally manage to get rid of the moon (what's left of it anyways). Sometimes translations work and sometimes they don't. This is a really excellent one that captures the dry humor and wacky personalities of the various animals, from the panic-stricken squirrel to the angry billy goat, delighted mice, and resigned Hedgehog. The jail scenes are in stark shades of black, white and gray, but the rest of the illustrations are dominated by the great, round, yellow globe of the "moon". Squirrel has a little red shading and there are a few bits of color on the leaves, grass, and other animals, but the bulk of this story is told through the increasingly hysterical text and clever use of illustrations. The sketches, like the coloring, are understated for the most part but convey a vivid feeling of movement and action as each fresh stage of crisis emerges. Verdict: This doesn't have quite the wide child appeal of Winter, but it's still a hilarious and clever story that children and grownups will appreciate. Recommended. This is a republished title in a new series from Blue Apple that encourages parent and child interaction. The book has a note from Harriet Ziefert to parents at the beginning, explaining active (dialogic) reading and offering suggestions and ideas for using the book to talk with children and expand on the text. It starts with a few simple question and answer sequences for a seal, mandrill, coyote, and chimp. The text is very simple. 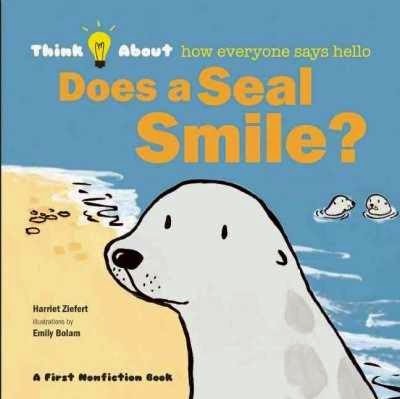 The first page will read "Does a animal smile?" Turn the page and it says "A animal does not smile." and then in a sentence or two explains how that animal greets other animals. However, when it comes to the chimp the text changes and expands on how chimps use their body language to communicate. A further spread shows two different chimps and what they are communicating, and then a photograph of chimps with an open-ended question "What do you think these chimps are communicating?" Another spread shows four different animal pairs and a brief caption that explains what their body language shows. Then the second part of the book begins, talking about how human beings greet each other. It begins with a baby learning to interact with people around them and then talks about different ways people greet each other around the world. It ends showing a little boy with arms held wide asking "How do you greet someone you know?" facing an illustration of the coyote from earlier in the story howling. A last spread discusses in more depth ways to think about how people and animals greet each other and more activities and projects, like observing a baby or drawing pictures. I wanted to really like this, but I just couldn't get into it or visualize using it in storytime. While I do use active or dialogic reading extensively in my storytimes and outreach visits, especially with nonfiction, I felt that this tried too hard to get there; rather than presenting a story and art that would naturally spark discussion, it started all the discussion for you. The book itself, with cute illustrations and simple text, seems aimed at very young children but the additional activities sound more like a kindergarten or even elementary audience. Verdict: This might work in your library, but it just really didn't click for me. I have a lot of good sources for nonfiction at this point and don't need something I'm not 100% positive about. The big news this week was that my associate had her baby last Sunday! He came about a month early, so we really should have planned that baby shower a little earlier....I had to recalculate my to do list, but now she'll be back earlier in the fall, hopefully, which will be nice. Lots of volunteers showed up this week, as did ridiculous amounts of books. Sometimes volunteers make things go faster and sometimes they....don't. Not that they're not helping, but it takes time to supervise etc. And, of course, the dang inventory scanner always acts up. This year it's the wifi connection *mutter*. I finally decided to be done with inventory on Thursday, even though we hadn't done any of the juvenile fiction and nonfiction or the bulk of the picture books. I just couldn't take it any more. When I first saw these advertised, I knew they would be huge hits among my patrons. My kids absolutely love nonfiction/fiction hybrids and DK is well-known for picking high-interest topics. I read this as a preparation for my book club, since one of the kids had expressed an interest in horses. The framing story is about a girl named Emma who, along with her older sister Amanda, absolutely love horses. Emma is thrilled that she can finally join the Horse Club at school. With Amanda as president, she's sure they can come up with some great ideas - and they do! After a lot of hard work, they're able to take the whole club to horse camp over winter break. Once there, Emma finds out it's not exactly as she'd imagined; she has a frightening experience with her horse and her older sister has started pulling away from her to have her own friends and interests. But with lots of hard work and some last-minute luck, everything works out and Emma and Amanda come out on top in the end. The story is interspersed with nonfiction segments about horses and photographs. These include instructions on saddling a horse, parts of the horse, information about gymkhanas, and more. The story ends with a spread on "Help a Horse" which is designed to look like a website. No web address is given, but it appears to be referring to "Help a Horse Day". At least, that's the closest thing a quick online search got me. There's a list of questions about the story, instructions on starting your own club, and a glossary. Verdict: The story is clunky in places and the emphasis on Emma's special connection with her horse and the perfect ending are pure wish-fulfillment for horse-loving readers, but that's what this is all about! 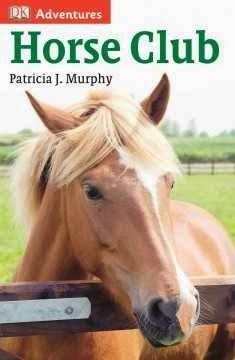 It's not great literature, but it will certainly capture the interest of readers who love horses and want to dream about riding or owning their own. Certain to be a popular title, this is available in both an affordable hardcover and sturdy paperback. Highly recommended. This is a title in the Jump-Into-Chapters series started by Blue Apple. It features easy readers in comic format. 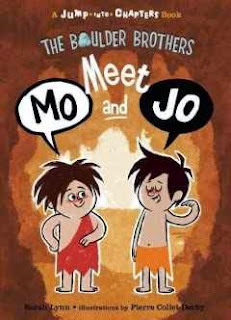 Mo and Jo, two caveboys, go through a series of silly and mild adventures in this collection of stories. First, they investigate a mysterious stink. A lot of bathing happens before they finally track down the source. Next, they try playing hide and seek but Jo doesn't quite get it and it takes a lot of discussion and false starts before they figure out how to play. Finally, the two boys try to find a way to warm up and try lots of silly solutions before they stop shivering - and start sweating! The reading level of this book is easier than the other title in this series I looked at. In keeping with their caveboy setting, they use few words and short, incomplete sentences. The boys have a slighter darker skin tone than appears on the cover and they seem to have a younger sister with curly red hair. The pictures blend smoothly with the minimal text, making this an excellent beginning reader. Verdict: This is definitely one to add to your easy reader section. The large type, short words and sentences, and colorful pictures blend together to create an fun and attractive book for beginning readers with a sense of humor. Recommended. 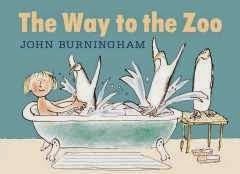 Sometimes I love John Burningham and sometimes I really, really don't. This latest book, however, takes me back to the magic of his earlier books, especially Mr. Gumpy. It perfectly captures the magic of imagination and childhood. One night Sylvie imagines there's a door in the wall. When she checks the next evening, she finds the door is really there. She opens it, goes through the passageway she discovers and finds a heavy door that leads to....the zoo! However, it's getting late. Sylvie has to go back to bed and, naturally, she asks if anyone would like to go with her. The story progresses through her nightly visitors, some of whom make better roommates than others. But what will happen when Sylvie leaves the door open one morning before leaving for school? With some of Burningham's recent books, his art seems to have moved farther and farther away from the strictly representational. In this book, he returns to the simpler, clearer illustration style of his earlier works. Sylvie is a thoughtful little girl in a school uniform or pajamas. The animals have Burningham's distinct elongated, sketchy style, but are still clearly identifiable. Sylvia stands alone, a simple figure in white space, as the animals enter her world, finally exploding in a chaotic scene that ends with a mischievous punch line. Verdict: This is a little long for storytime, and the more subtle humor may not capture the interest of younger children, but if you have an older audience it will be perfect. 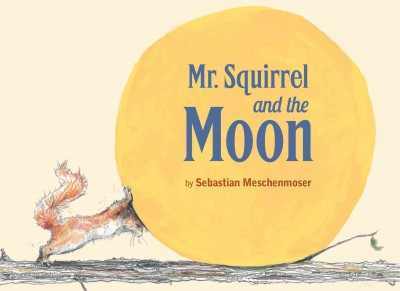 It would also make a great read-aloud to an imaginative child, or anyone who likes animals. Recommended. Personally, I rather like spiders. I keep them in my house to keep down the annoying little flies. One of the few things that really exasperates me is a squealing little kid who's been taught by their parents that spiders are "scary" or "icky". So, I was inclined to be annoyed at this book at first. But...it's just....so much fun! I can't resist it. The unseen narrator is trying, really hard, to love spiders. After all, they are amazing creatures! They practically have superpowers! They....AUGH SMASH IT SMASH IT. oops. Maybe next time? The book is packed with factoids about arachnids, but it's also full of silly jokes, lots of yelling, and, of course, handprints for smashing if it all gets to be too much for you! 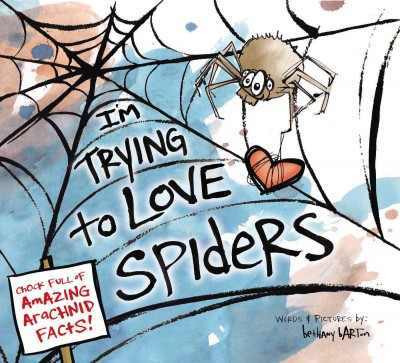 Barton's messy drawings are the perfect accompaniment to this lively and wacky story, with spiderwebs, blobs of ink, spilt paint water, and the occasional smooshed bug stain spilling over the pages. Verdict: This isn't going to be for every audience. Kids who are genuinely afraid of spiders, or a little too eager to smash every living thing that's smaller than them, are unlikely to benefit. For maximum effect, a group small enough to take turns swatting the page would be ideal as well. However, it's a delightful novelty title with a fresh approach to spiders. Purchase where interactive books (and spiders, alive or dead) are appreciated. It's hot. I hate being hot. I'm a little depressed at the dramatic drop in circulation in July, even though it was not unexpected due to weather, changes in summer school schedule, and the new pool. Friday I supervised the summer knit-in. And crocheted, of course. Updated calendar again. Things keep changing. My regular - tried nonfiction this time. Sally has been living at a special facility for children with disabilities for five years. She has cerebral palsy but now she's finally coming home to stay. She's excited, scared, and worried all together. Her family is familiar and yet strange and there are so many new things to navigate, from getting dressed by herself to going to school. When she gets a dog, at first it seems like one more thing she can't handle, but together they slowly change and grow until Sally changes from being "Scarey Sarah" and her dog Susie changes too. Together with her friends, she learns to fit into her family and her new world. This book was republished in 1995 but quickly went out of print again. I would like to see this republished, but updated. I don't often say that with books, but it's such a really, really good book and from the perspective of a child with a disability (how often do you see that? not the foil for the main character, not the plucky friend who gives wise advice to the main character, no the MAIN CHARACTER HERSELF) that it would be worth updating the factual information about cerebral palsy and how it's treated. Sally is a real little girl, not defined by her disability, but not unaffected by it either. She has to struggle to be independent, to do the things that others find so easy. She's not a cardboard cut-out child - she gets upset, doesn't try, feels angry and worried and scared. Her family and friends are perfectly cast and are just as real as Sally is. They don't have perfect lives any more than she does and, if there was a lesson to this book, it would be that everyone has their own difficulties to overcome. Verdict: I've never really found another author who wrote so simply and realistically about children with disabilities as Jean Little. It would be amazing if publishers would update some of the factual information and a few references to clothes etc. and republish these with new covers. 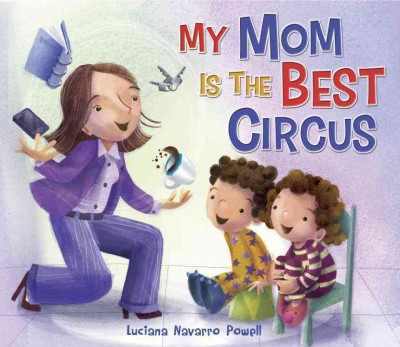 Two children of indeterminate genders narrate their mom's circus acts throughout the day, from magic to acrobatics. The pictures are cute, although they feel a little static to me. The mom's purple suit and the kids' colorful pajamas are good focal points. You really can't separate the pictures and text in this book, as the book only "works" when you see the circus acts the mom is performing. For example, when the child says "Mom can tame wild beasts without blinking her eyes." The illustration shows the mom wrestling a mass of laundry into the washer. Verdict: It's a nice idea, and it's interesting to see what appears to be a working mother, but like many good ideas, it doesn't translate well to a board book. The kids appear to be preschool age at least and it looks like they are left home alone while the mom goes to work - no caregiver is shown. Toddlers or even preschoolers won't have much context for the circus theme and many of the "acts" are too subtle for them to make the connection. For the parental audience, I have a feeling that both my working and stay at home moms would kill me if I put this in the collection - a book about an always perky, can-do-anything, never tired, immaculately dressed, single working mom who balances her home life and work life with apparently effortless ease is just going to annoy people. I was skimming through a giant stack of picture books when this one popped out and thwapped me in the eyes. It's nothing fancy or new, but it's a solid, great book. The text is extremely simple, just a rhyming couplet split across each spread; "Kitty cat, pretty cat./Living in the city cat." A curious cat accidentally stows away in a truck and is carried off. She escapes, but is hurt and taken to the pound. Luckily, her owner shows up and soon she's back home and safe again. This is a perfect text for a toddler; bold, rhyming, simple, and with a strong narrative as well as textual rhythm. Small children will be very pleased with the simple progression of the story and satisfied at the happy conclusion. The illustrations show a plump grey cat with a blue bow on her tail. They're separated into full-page spreads and smaller inset panels and illustrations. They're colorful without being garish and have a warm, friendly style that will be very accessible to young children and their parents. Even nicer, the cat's owner has dark skin and exuberantly curly hair, the girl who finds the lost cat also has dark, curly hair but lighter skin, while the third person pictured at the shelter has long blond hair. Diversity naturally and realistically portrayed in a fun story about a favorite animal. Verdict: This is a perfect book for toddlers - and the author has an earlier book called Doggone as well! Highly recommended for your toddlers and their storytimes. Last week, I looked at The Dirtmeister's approach to geology. This week, I'm looking at a very different book but which deals with roughly the same subject. Simon Winchester opens the book with a lengthy introduction about himself, starting with his education as a geologist, his decision to become a journalist and then a writer, and how much geology still matters to him and is integrated into his writing. There are three main chapters, dealing with the subjects of the subtitle. Each one weaves personal experience, stories of true disasters, and the geological science behind the events as well as current science and research. A brief afterword talks about the "natural" aspect of these events and having respect for the earth. Back matter includes further reading, websites, and films, acknowledgements, and index. This was much slower-paced than Dirtmeister and it took me longer to get into the book, but once it really got going, in the volcanoes chapter, I found it impossible to put down and I finished the book with a much greater understanding of the science behind these natural disasters. I'm still not planning to live anywhere near them though and have given up my long-cherished dream of eventually moving out to the northwest coast. Winchester is a good writer and puts together history, current events, and science in a way that's readable and interesting, if a little slow at times. Rather than compare this book to last week's review, I'd say they are for two completely different audiences. Dirtmeister would be a great resource for an earth science unit or for younger kids to browse and try out a few experiments. 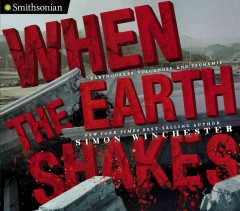 When the earth shakes is for a more serious reader who is interested in science and history and wants a comprehensive look at these events and the science behind them. Verdict: If you can only get one of these titles, I'd go with Dirtmeister because it covers a wider range of science and will appeal to a wider audience, but ideally you'd purchase both and recommend When the earth shakes to strong middle grade readers who are interested in natural disasters and the science behind them. Recommended. PANIC. My Storywagon performer had to cancel due to illness. Luckily, Science Alliance came through for me, but it was a very frantic afternoon of phone calls! It was a good thing I got a backup - we had a huge group of people for Pattie's toddler times in the morning and then 117 for the Science Alliance show. Only about 30 people showed up at Lego Club, but they were about 70% new and extremely enthusiastic. They were all very excited about coming back in the fall and I consider this one of my more successful Lego Clubs with the connections that were made. Worked on movie collection development - replacing/weeding titles that have checked out over 200 times, clearing out duplicates, etc. in preparation for the massive reflux of returns. John Cena, Randy Orton, more easy reader wrestling books! Book suggestions for a 5th grader - this was a difficult one since she wasn't there, but from what I elicited I suggested Ingo, Amelia Rules, and How to survive middle school. Suggested audiobooks for a family going on a trip - you don't have to take just movies! Bridges and castles, especially drawbridges, for a four year old.